Today we will look at the Octaband®. 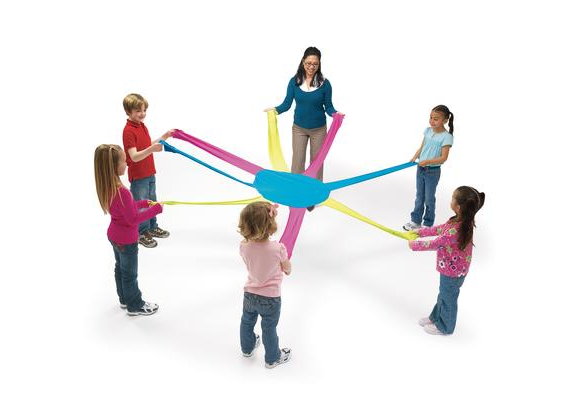 The Octaband® is a great tool for group activity. It helps to develop strength and motor coordination while developing the ability to function as part of a group. Listening skills, teamwork, attention, and cooperation can also be taught. The Octaband can be used while sitting or standing and can be used with the hands or the feet. · Ring Around the Rosey. Have each child grab one arm of the Octaband and stretch it to its full length. The arm must be kept at its full length while the children walk in a circle to the Ring Around the Rosey tune. When they "all fall down" they must let go of the arms of the Octaband and grab a different color for the next round. · Play Duck-Duck-Goose. Each child sits and holds a fully extended arm. When the "goose" gets picked, they caller needs to get to the open arm and stretch it out before they are safe. · Play Hokey Pokey. When the children "turn themselves around" they have to hold the arms fully extended while they spin in a circle. · Have each child grab hold of one arm of the Octaband. Call out a color and the children holding that color must stretch out and come back to the circle. Give them unique moves to do when they come back into the circle such as spinning into the circle so that the Octaband arm wraps around their body, hopping in on one foot, taking one big jump to return, etc. · Work on teamwork and sequencing by doing "the wave". All the children holding the pink arms pull out and come back. When they get to the center, the children holding blue pull out and come back followed by the yellow. See how many correct rotation the group can achieve. · Holding an arm in one hand (specify left or right) have the children rotate the Octaband to the opposite hand to spin it in a circle. Perform with both hands. For more information about the Octaband® and other great items please visit http://www.achievement-products.com. Scott has provided some really great and creative ways to use items (that may have been voltairediamonds.ie originally designed for typically developing children), in special needs environments.